Krupówki Street passes through the heart of Zakopane and ranks among the most famous streets in all of Poland. Stretching for a little over half a mile (1 kilometer), the walking street is lined with restaurants, hotels, bars and boutique shops selling sportswear and luxury fashions. No matter the season, Krupówki Street always bustles with activity; street performers entertain passing tourists while portrait artists draw caricatures. Horse-drawn carriages ferry passengers up and down the promenade. Each summer, the street hosts the International Festival of Highland Folklore, one of Poland’s oldest and largest folk festivals. Try to visit Krupówki Street during the day and in the evening, as the vibe will be completely different. Escape the city for a day and swap Krakow for Zakopane and the Tatra Mountains on this full-day tour. Take a dip in thermal pools, go for a hike up Gubałówka Mountain, or ride the funicular and enjoy panoramic views across the range. Alternatively, explore the town and its unique architecture, and immerse yourself in the highland culture at your own pace. A complimentary self-guided audio tour of Krakow is included for use at your leisure. See the traditional wooden homes of Chochołow, the hills of Zakopane, and the thermal pools of Chocholow on this day trip from Krakow. In Zakopane, you’ll have a chance to walk down Krupówki Street in the city center and admire the views from Gubałówka Hill. Spend 3 hours relaxing in the thermal pools of Chocholow before your return to Krakow. Take advantage of Zakopane’s close proximity to Krakow on an 8-hour day-trip to the winter capital of Poland. Depending on the interests of the group, your guide customizes your itinerary for maximum enjoyment. Enjoy the gorgeous scenery of the Tatra Mountains, shop for artisan souvenirs on Krupowki Street, replete with restaurants and shops, ride the cable car to the summit of Gubalowka Mountain, and learn about the indigenous Goral culture. Lunch and hotel pickup and drop-off are included. This is an ideal tour for nature lovers who want to see some of the most beautiful scenery in Poland. Escape the city of Krakow for a day and travel in a private vehicle to the Tatra Mountains. By traveling with a guide, you’ll find out information you wouldn’t discover alone—such as the inspiration behind the highlander architecture. Highlights include the views from Gubalowka mountain, exploring Krupowki street, and driving past Chocholow village. Visit the scenic Tatra Mountains area from Kraków the easy way on this day trip to Zakopane. Don’t worry about long-distance public transportation, as you’ll travel in a comfortable private vehicle. View the popular Ski Jumping Hill of Wielka Krokiew, and see the many shops and restaurants along the main street—Krupowki Street. Nature lovers will enjoy this opportunity to visit the picturesque mountainous area. Avoid the hassles of self-drive on this transport-only private tour to Zakopane, a resort town at the foot of the Tatra Mountains. See traditional wooden houses at Chocholow, soak up panoramic views from Gubalowka Hill, then visit the Old Cemetery of Peksowy Brzyzek and enjoy free time on Krupowki Street. 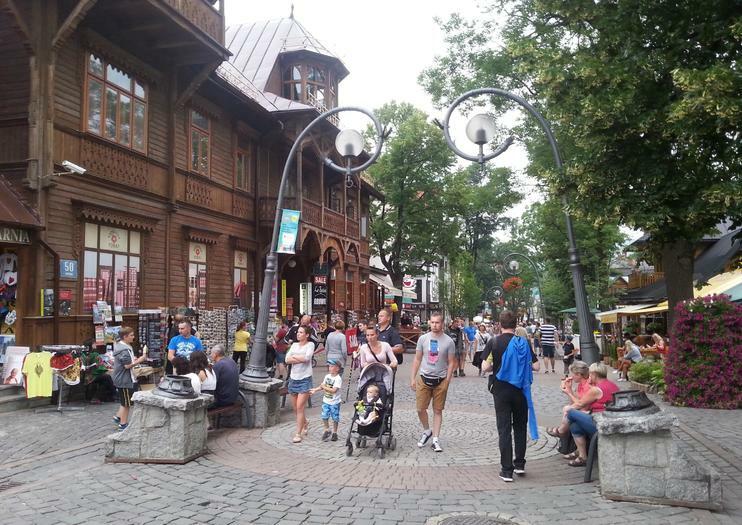 The best way to get to know Zakopane is to walk around the streets and learn about it's rich history and numerous famous artists and other interesting people that called Zakopane home. Walk around with our guide and see many of the different building styles in Zakopane, including the now famous Zakopane style wooden houses. Visit Krupowki and look past the busy crowds to the interesting old buildings which ones where of much importance for the development of Zakopane. Visit an old highlander museum to get a look into how people lived here in times pasts. Our guide will take you to the most interesting sights and guide you through our unique city. The most important attractions of Zakopane and the famous rafting on the Dunajec gorge, that is everything you need to see in Podhale. Fantastic location makes Zakopane the best viewpoint of the Tatra Mountains. It is a wonderful place to relax at any time of the year. In addition, the Dunajec Gorge is one of the most beautiful breakthroughs on our continent and it forms the largest tourist attraction on a European scale. On the way, great views of the Pieniny, Czorsztyn Lake and castles in Niedzica and Czorsztyn. Experience the diversed folk culture and the crystal clear air of the Polish highlands.Zakopane - the tourist centre of winter sports and mountain tourism is located at foot of the Tatra Mountains. The town offers many monuments of old wooden architecture built in the peculiar, local style (so called "zakopane style"). After you get to Zakopane, you can enjoy a cable car ride up the Gubałówka Mountain and then a walk along its ridge to Butorowy Wierch or Szymoszkowa maedow. Next you will go down on a chairlift to take a walk around the Old Town of Zakopane. In the town you will visit the charming old parish church & unique cemetery, Willa Koliba (museum of the "zakopane style") and the finest example of the zakopane style: Jaszczurówka Chapel. Some time for lunch at Krupówki Street (nowadays the main street in the town)and your own explorations of the enormous regional market will make your experience complete. Visit the most interesting sites in Poland! From city to city you will use fast railway connections. It gives you opportunity to see rural landscape.